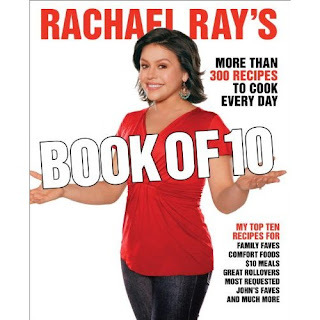 Rachael Ray's newest cookbook, Rachael Ray's Book of 10: More Than 300 Recipes to Cook Every Day, was published last week. This book is set up in ten chapters, with three lists of ten in each chapter. For example, the "Stretch-a-Buck Meals" chapter has lists of "Family Faves," "Most Requested," and "Great Rollovers." In addition to "Stretch-a-Buck Meals," you'll finds lists for entertaining, burgers, vegetarian, 30 days of pasta, seafood, one-pot meals, chicken, meat, and date nights. I picked up my copy over the weekend (ah, how life has changed since I had a child) and tried one of the recipes over the weekend. I made the Cumin and Lime Roasted Pork Tenderloin with Spicy Creamed Corn (originally from 365: No Repeats) and it was seriously great. So good my husband even took the leftovers to work today, which hardly ever happens. Overall, I'm impressed by this book. It does have recipes that I've seen before, but they are organized in a new way (which is great for obsessive RR recipe makers like me). I pretty much only make Rachael Ray's recipes (I know, I know), so it's nice to be able to flip to a list of what she considers to be her best budget recipes or one pot meals. Plus, there are a ton of new recipes to try out. As I noted before, I'm not in love with the cover, but this cookbook has joined my other RR books on my kitchen counter for easy reference! Thanks for sharing your review! I'm looking forward to getting this book. Glad to know there are some repeated recipes... I think I would have been disappointed to see them if I didn't have a heads up that there were some in there!